Posted on Tuesday, October 4th, 2016 in Conservation, Interview, Kafue National Park. After I returned from Busanga in Kafue National Park, I caught up with lion researcher Dr. Neil Midlane, who spent three field seasons there – from June 2010 to November 2012 – completing research for his PhD, entitled The conservation status and dynamics of a protected African lion population in Kafue National Park, Zambia. Sadly, it seems as if the recent phenomena of demand for lion bones in traditional Asian medicine is now impacting Kafue’s lions. Neil’s research for his PhD showed that there are probably an estimated 500 lions over one year of age in all of Kafue and its surrounding game management areas, and about 200 lions in the 11 000 square kilometer northern section, where Busanga lies. As way of comparison, South Africa’s Kruger National Park (which is a bit smaller than Kafue National Park) has about 1 800 lions, although Neil points out that Kruger’s soils and habitat can support a higher prey density, and therefore more lions. Even though northern Kafue has close to 1 000 mm of rainfall (twice that of Kruger), the soils are generally poorer, and drain very quickly. Most of Kafue comprises miombo woodland, and doesn’t sustain high prey densities. Busanga’s well-watered grasslands are the anomaly, however, and attract far more antelope and buffalo than the south. 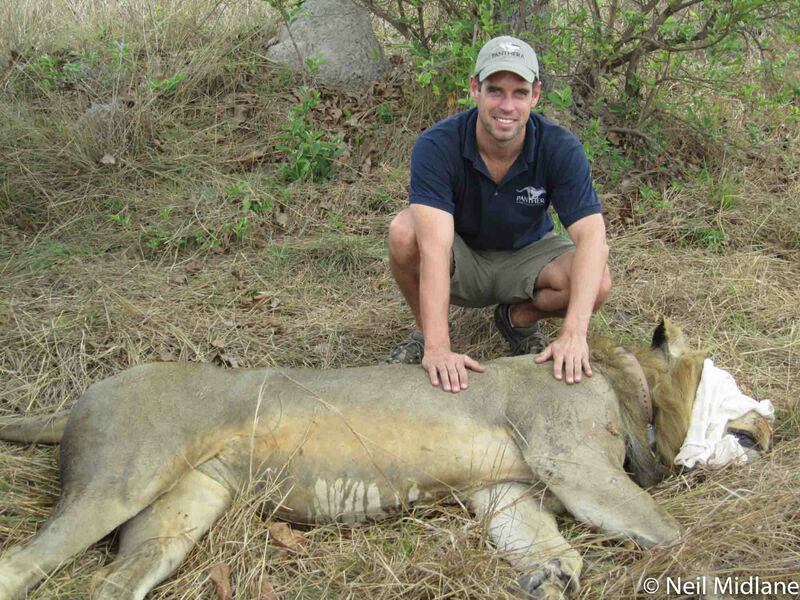 Neil’s research also showed that hunting quotas of lions in the surrounding nine hunting concessions were way too high, with 23 male lions on quota every year. The lack of controls and poor record keeping suggest that maybe even more males were shot every year. Recognizing the potential damage to their tourism industry, Zambia banned hunting of all lions and leopards in 2013, citing a lack of information on predator populations in the country. 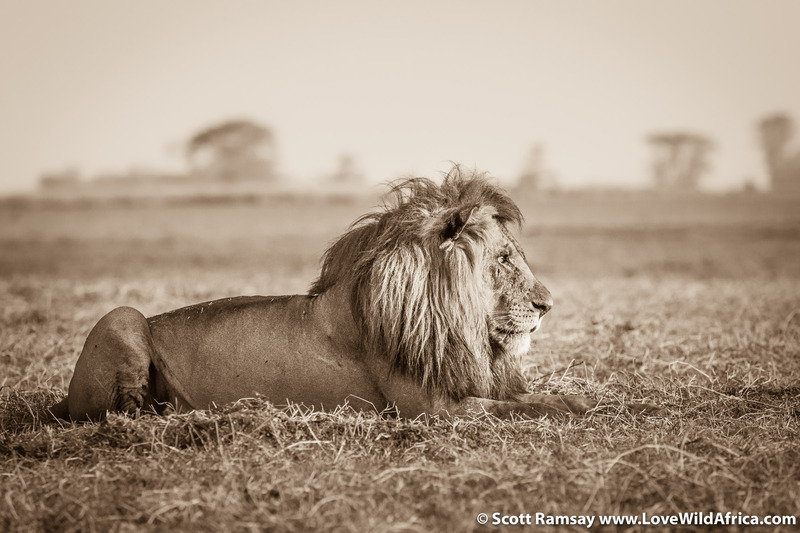 Neil’s research suggested that just five or six male lions should be hunted across all of Kafue’s game management areas every year. And as much as he dislikes the shooting of any male lions, Neil is pragmatic about the value of controlled and well-managed trophy hunting. According to Neil’s research, already a quarter of the land in the game management areas has been lost to agriculture. Neil adds that hunting quotas must be set with rigorous scientific research, and there needs to be stringent enforcement of the quotas and regulations. While Kafue’s lion population is sizeable, it could become a recognized “lion stronghold”, defined as a park that protects at least 500 lions, and whose population is stable or increasing. “Based on my research, and prey densities, I believe the park could probably hold as many as 1 000 lions, if it was managed and protected optimally, with all the required funding,” said Neil. Africa’s lion population is currently estimated at no more than 30 000, and some experts consider it to be as low as 20 000. In just two decades, Africa’s wild lion population has halved. A burgeoning rural population continues to put pressure on natural habitat, especially outside of protected areas, where lions come into conflict with both humans and livestock. And it’s the lions that always have to give way to human interests. They are shot, snared or poisoned. “Kafue is clearly an important conservation area for this iconic species. There are only six lion populations in Africa of 1 000 animals or more, and Kafue has the potential to be the seventh,” said Neil. When I returned home, and after chatting to Neil, I also found myself thinking of Busanga regularly, and of how precious it is, especially in today’s world where national parks in Africa face immense challenges and threats. I’d like to get back there, to tell more of it’s story. And I hope that one day Kafue will be home to more than 1 000 lions. 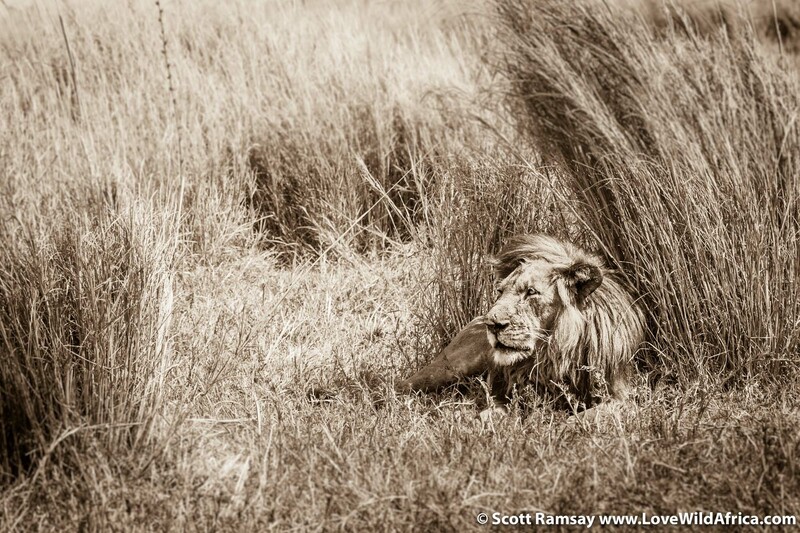 Neil Midlane and collared lion in Kafue. Neil Midlane and team, with one of the lions which were collared as part of his research in Kafue. 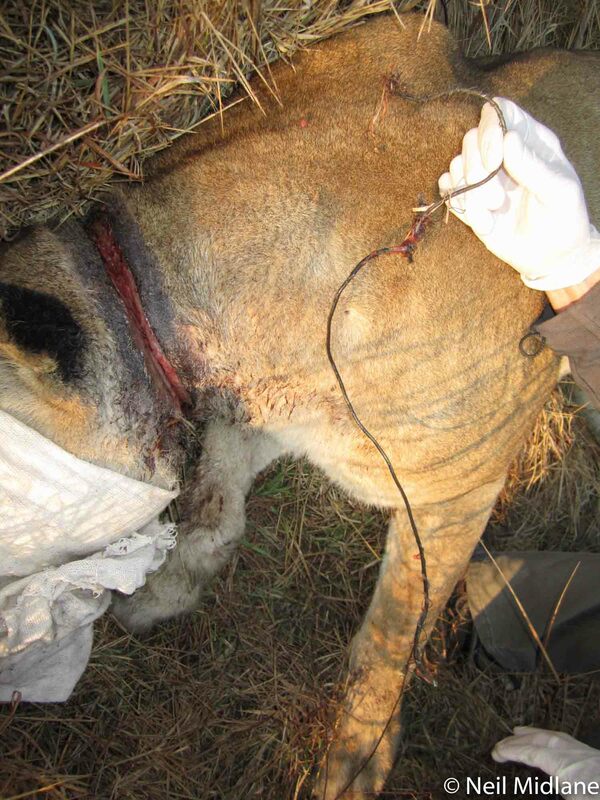 Lion researcher Neil Midlane in Kafue regularly encountered lions which had been wounded by snares that had been set by bushmeat poachers. 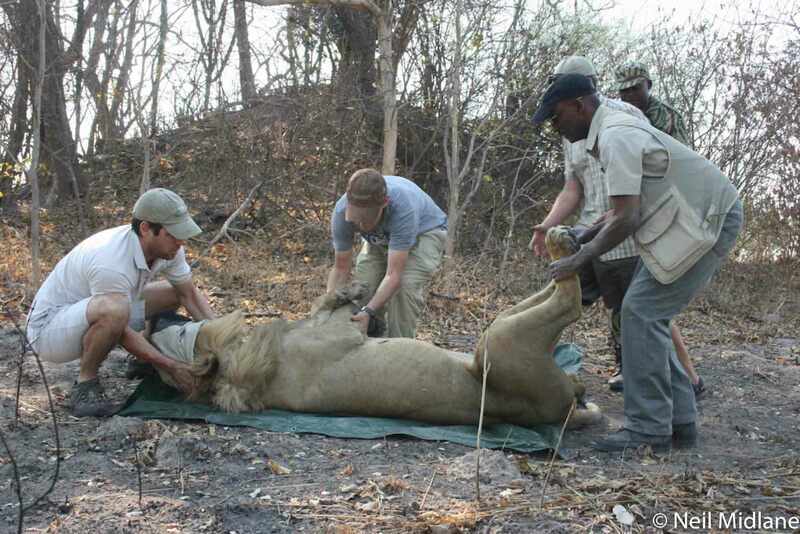 Whenever possible, Neil and his team darted the lions and removed the snares. In most cases, the lions survived. Lion resting during the day. We were alone with this male for a few hours. 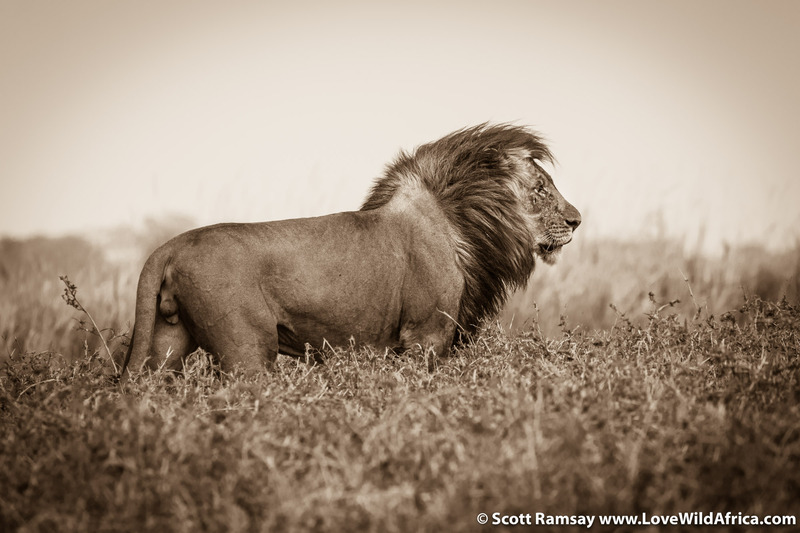 Will the sight of a lion on African savanna still be relatively common in a 100 years? 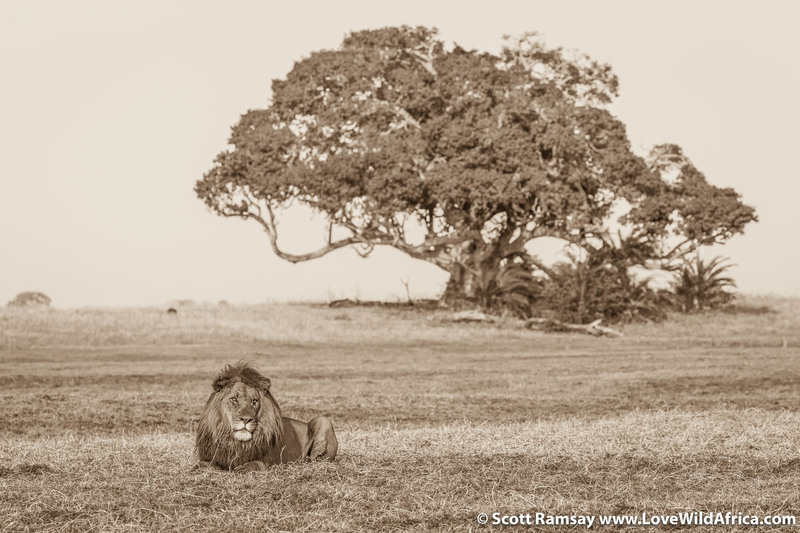 Male lion on the plains in front of a huge sycamore fig tree. To me, a lion standing tall on an open plain defines the African continent. What would Africa be without wild lions? Hands-on, relevant research such as that conducted by Neil Midlane in Kafue is crucial for the species’ continued conservation.